All ten episodes from the fifth series of the action drama based on the novel by former Special Forces operative Chris Ryan. In this series, Section 20 continue their globetrotting military missions as Sgts. 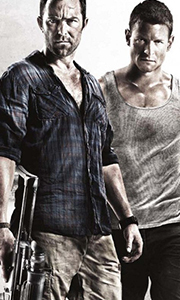 Stonebridge (Philip Winchester) and Scott (Sullivan Stapleton) travel to Thailand to find the kidnapped daughter of the British Ambassador where they are caught up in a plot to bomb the embassy. After a North Korean general dies in .. Section 20 returns with two new highly-skilled and battle-hardened operatives - British Sergeant Michael Stonebridge and ex-US Delta Force Commando Damien Scott. Tasked by razor-sharp new section head, Colonel Eleanor Grant, to track the lethal, elusive terrorist Latif, in possession of an apocalyptic WMD, our heroes must put aside their differences and defuse a plot that could ignite a war. Strike Back: Project Dawn is a breathlessly t..
All ten episodes from the sixth series of the action drama based on the novel by former Special Forces operative Chris Ryan. In this series, Section 20 continue their globetrotting military missions as Sgt. McAllister (Warren Brown) is tasked with freeing the captive American Sgt. Wyatt (Daniel MacPherson) after the disbanded team are brought together once again by Colonel Adeena Donovan (Nina Sosanya). Together, they go after escaped t..
All ten episodes from the third series of the action drama based on the novel by former Special Forces operative Chris Ryan. Now taking their orders from new Section 20 commanding officer Major Rachel Dalton (Rhona Mitra), agents Michael Stonebridge (Philip Winchester) and Damien Scott (Sullivan Stapleton) soon find themselves in Africa trying to stop billionaire Conrad Knox (Charles Dance), who aims to use stolen Libyan nuclear devices..
Based on Chris Ryan's best-selling book, Strike Back is a compelling story of betrayal, glory, redemption and revenge played out through the interlinked lives of two former soldiers; military hero Hugh Collinson (Andrew Lincoln) and discharged veteran John Porter (Richard Armitage). Their paths last crossed seven years ago. Now, amidst a new hostage crisis in the Middle East, their lives are about to collide again. In three stand-alone ..
CHRIS RYAN'S STRIKE BACK: Based on Chris Ryan's best-selling book, Strike Back is a compelling story of betrayal, glory, redemption and revenge played out through the interlinked lives of two former soldiers; military hero Hugh Collinson (Andrew Lincoln) and discharged veteran John Porter (Richard Armitage). Their paths last crossed seven years ago. Now, amidst a new hostage crisis in the Middle East, their lives are about to collide ag..
Every episode from series 1-4 of the action drama based on the novel by former Special Forces operative Chris Ryan. The first series follows ex-SAS Sergeant John Porter (Richard Armitage) and MI6 officer Hugh Collinson (Andrew Lincoln) seven years after they participated in an operation in which two soldiers were killed. Porter is redrafted to save a British journalist who has been abducted, the Zimbabwe government holds the UK responsi..
Every episode of the action drama series based on the novel by former Special Forces operative Chris Ryan. The first series follows ex-SAS Sergeant John Porter (Richard Armitage) and MI6 officer Hugh Collinson (Andrew Lincoln) seven years after they participated in an operation in which two soldiers were killed. The second series, 'Project Dawn', follows the efforts of Section 20 agents Michael Stonebridge (Philip Winchester) and Damien.. The Emmy-nominated series Strike Back returns for a fourth series with a ten-episode run, traversing the globe from Colombia to Lebanon and Russia. Strike Back: Shadow Warfare sees S20 pit against al-Zuhari: an Iranian terrorist bent on perpetrating violence on European and American soil to deter the West’s involvement in Iranian-influenced countries. On the world’s most wanted list for decades, al-Zuhari’s very name commands respect fr..
Own Strike Back Series 1 to 2 DVD from Deff, DVD, Blu-Ray & 4K Video Specialists - Free UK Delivery..